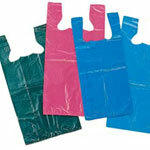 Not just a simple store supply, your bags & boxes are also a key element in the strengthening of your brand. Be sure to spend a little extra to have your logo placed on your choice of bags or boxes – it’s a small price to pay for a huge return in brand recognition. To see our complete line of packaging click here.